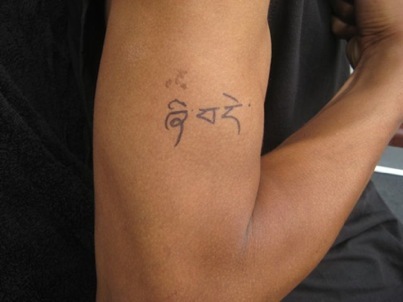 A good way to check and see which Tibetan Tattoo is perfect for you! Here is husband again sitting patiently as I take lots of pictures. 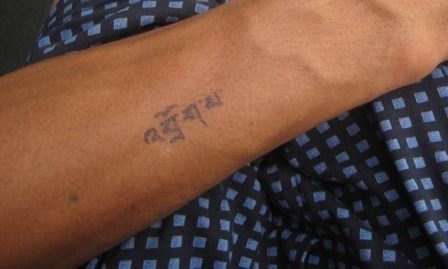 I wrote these words on his arm just to see what 'Sunflower' in Tibetan would look like, nice yes? I use a thin black ink marker to make my homemade temporary tattoos! 'Nyi-ma' means sun and 'Me-tog' means flower. 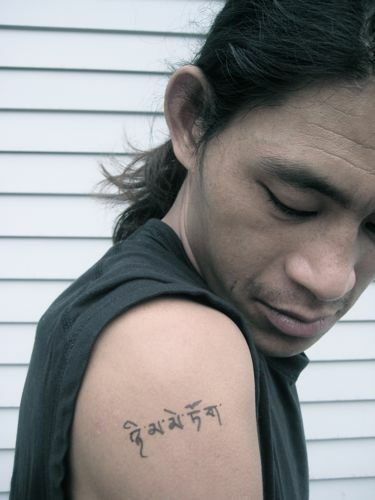 Nyima is one of the most popular names in Tibet. Dawa or Moon is also a popular name for a girl or boy. The Sun and Moon are auspicious symbols in Tibetan Buddhism and are seen frequently in Buddhist art. 'Shi-Day' means peace or peaceful in the language of Tibet. This is a popular name for a boy. This last one says 'Drogpa' or Nomad. The Nomad tradition is still alive and kicking in Tibetan culture. My husband's family live in a large yak hair tent in the summer while caring for their herds of yaks and sheep. Here husband is exhausted and quite fed up with me...! Get your name in Tibetan on a cool tee shirt!